The Help. the big-screen adaptation of Kathryn Stockett’s best-selling 2009 novel, attempts to explore the complex relationships between black maids and the white women who employed them at a time when the civil rights struggle was just beginning to change the South. Set in Jackson, Mississippi, The Help boasts some impressive acting, as well as some understanding of the indigestible mixture of gentility, brutality, tension and moral rot that defined the Jim Crow era. Deluded whites may have thought of their maids as part of the family, but they objected if the maids wanted to use the same bathrooms as the rest of the “family,” and they certainly weren’t above patronizing and exploiting women who labored for as little as $182 per month. Despite all this, The Help shows that black maids often loved their white charges. Struggling to make ends meet, black women raised white kids with wisdom and affection — even while being subjected to unconscionable doses of daily humiliation. 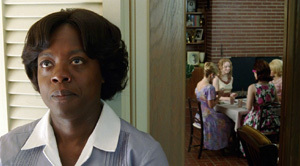 On screen, The Help displays great sympathy for the maids on which the story focuses, but the movie’s also saddled with a tired ploy, building its story around a recent white college graduate (Emma Stone) who aspires to be a writer. Hoping to provide a platform for voices that hitherto had not been heard in the white community, Stone’s Skeeter decides to tell the stories of Jackson’s black maids. Skeeter approaches Aibileen (Viola Davis) about helping to tell these stories from a black point of view. Aibileen, we learn, raised 17 white kids, and when we meet her she’s tending to the daughter of an incompetent and indifferent white mother. A word about Davis, who was nominated for a best-supporting actress Oscar for her work opposite Meryl Streep in Doubt. Davis seems incapable of hitting a wrong note. She carries the weight of Aibileen’s past with bitterness, rue and grace. You get the sense that Davis knows the truth of every scene in which she finds herself, and isn’t afraid to speak it. The outspoken Minny (Octavia Spencer) emerges as the movie’s other principal maid, a sout powerhouse of a woman who winds up working for Celia Foote (Jessica Chastain), a befuddled bleach-blonde who’s inept at being a wife and whose lower-class origins revolt Jackson’s bridge-playing set. Spencer can be a funny and quick, but I had a slight qualm about the way she turned Minny’s indignation into entertainment. Sporting a mass of tangled curls, Stone creates an intelligent small portrait of rebellion as Skeeter deals with her mother (Allison Janney), a cancer-stricken woman who wants nothing more than to see her daughter marry. Bryce Dallas Howard plays Hilly Holbrook, the movie’s resident ogre, a white woman of bitchy, racist sensibilities. The Help has been criticized for turning Howard’s character into a caricature. I get that, but it’s worth remembering that subtlety wasn’t a hallmark of Southern racism in 1963. As non-threatening as a racial drama can be, The Help unfolds episodically with occasional references to brewing turmoil in the South, notably the murder of Medgar Evers. Evers’ murder galvanizes the maids, encouraging them to tell their stories to Skeeter, who needs at least a dozen such tales to get her book published. Carefully appointed and prone to nostalgia, The Help hits its share of wrong notes: A joke about “the terrible awful” — perhaps the movie’s biggest crowd-pleaser — is as overworked as the movie’s maids; and first time director Tate Taylor, an actor and friend of the novel’s author, can’t resist drawing out the movie’s ending lest he leave risk leaving us even a little uninspired. Worse than any of that, The Help — which is a bit of a curio — may encourage misguided feelings that racism somehow has been safely locked in the closet of the past where it no longer can do any harm. For all its virtues, The Help doesn’t go far enough, hit hard enough or dig deep enough. It could have benefited from less burnish and more bite.